Bust of Queen-Mother Idia, Benin, Nigeria, now in Ethnologisches Museum, Berlin, projected for transfer to Humboldt Forum, Berlin, Germany. 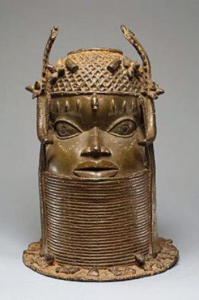 Four years of discussions among a “Benin Dialogue Group” have resulted in a tentative commitment between the Court of Benin, Nigerian museums and several European museums with major Benin collections to eventually establish a permanent display of loaned European museum materials in Benin City, Nigeria. The actual objects to be loaned and exhibited are expected to come from different museums on a rotating basis. 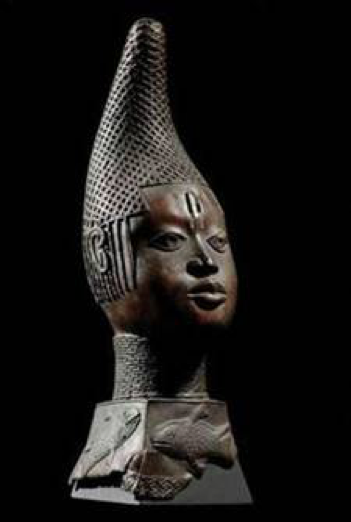 Major collections from Benin that form part of the discussion are in the Ethnological Museum of Berlin, the British Museum, and the Louvre, in Paris. Neither the items to be displayed nor which museum collections will be involved had been determined by the date of the meeting last April. 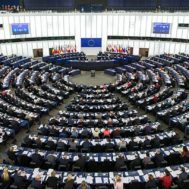 These questions are still unanswered, and at the most recent August meeting of the Benin Dialogue Group in Cambridge, UK, the remaining issues, such as a commitment from Nigeria to guarantee immunity from seizure, were not advanced. Other, more practical arrangements for insurance and security are, for now, also on hold, given the longstanding civil crisis in Nigeria. 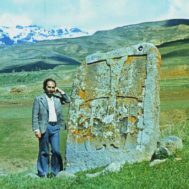 The Museum of Anthropology and Archaeology (MAA), part of the University of Cambridge’s Museum consortium, figured in the August discussions. In 2016, the Jesus College Student Union in Cambridge voted unanimously to repatriate a bronze cockerel known as the Okukor to Nigeria. The cockerel was taken from Benin in the notorious 1897 British punitive expedition. It was displayed as part of the décor of the dining hall in Jesus College, Cambridge for many decades. The Okukor remains at the college, but is now in storage. Opoku also calls the project by Western museums to loan back items to Nigeria, “a ridiculous scheme resulting from the miserable Benin Plan of Action for Restitution, to set up a Western museum in Benin.” He says that returns of important Benin objects to Nigeria have come about not in seizures but through voluntary returns by private collectors and museums in the West, citing to items returned by a British citizen, Dr. Adrian Mark Walker and by the Museum of Fine Arts, in Boston. Opoku faults the Nigerian government for failing to demand return of major artworks. He urges the Nigerian Government to make lists of all known items in Western collections from Benin, and to contact museums in the Western world requesting the return of Nigerian artefacts that may have been stolen, looted, or acquired under dubious circumstances, including especially the Benin artefacts that were taking during the British invasion of 1897. He says the Nigerian diaspora should make the same demands in their countries of residence and citizenship; further, he sees exhibition and even acquiescence to worldwide scholarship as capitulation. He says that no Nigerian official should be involved in any way with any display or publication of Nigerian materials in foreign collections. The Benin conflict in which many hundreds of extraordinary works of art were seized and taken to Europe began in the 1890s, when the Oba (King) Ovonramwen, Benin’s ruler, demanded that British traders in West Africa pay customs duties to Benin, and after a team of nine officers sent by Britain’s west African Niger Coast Protectorate to meet with him were ambushed and killed. The killing of the officers became the official justification for sending a 1,200 man expeditionary force to Benin City. The troops killed thousands and looted and destroyed Benin’s capital. The Europeans were astounded by the wealth, artistic elegance and skill in bronze-casting displayed in the Benin treasures. After Benin’s royal capital was looted, the objects were taken to Europe and scattered in many countries, where they have been, as Jonathan Jones notes above, ambassadors for African culture.